Since Mugspotters began I’m always on the lookout for new product and you can imagine my joy as I was weaving my way through the office and I caught site of this beauty. There it was, abandoned on the bottom shelf of a “D-End”. For those unfamiliar with the fascinating world of office furniture, it’s a simple storage unit, shaped like a letter D. In reality it’s a junk storage facility. Every now and again when there is a ‘Clear Desk Policy’ crackdown all the “comfort-flotsam” you surround yourself with on your desk which falls foul of the CDP will be shoved into the D-End….and then forgotten….and then binned. A quick survey of some of the D-Ends in our office contain a smorgasbord of random dreck such as spiral comb binders for presentation documents, a large salad bowl, procedure manuals from 2004, random cardboard boxes, discarded letter trays (without the risers) et al. It was here amongst this debris that I spotted REED HEALTH. Quite why it had come to be in the D-End is a unknown tragedy. It showed signs of neglect and required a good valet with a few screen wipes. Worryingly it still contained some putrid liquid therein but due to my lack of any sort of Hazmat accreditation, I left the lid fully screwed on. 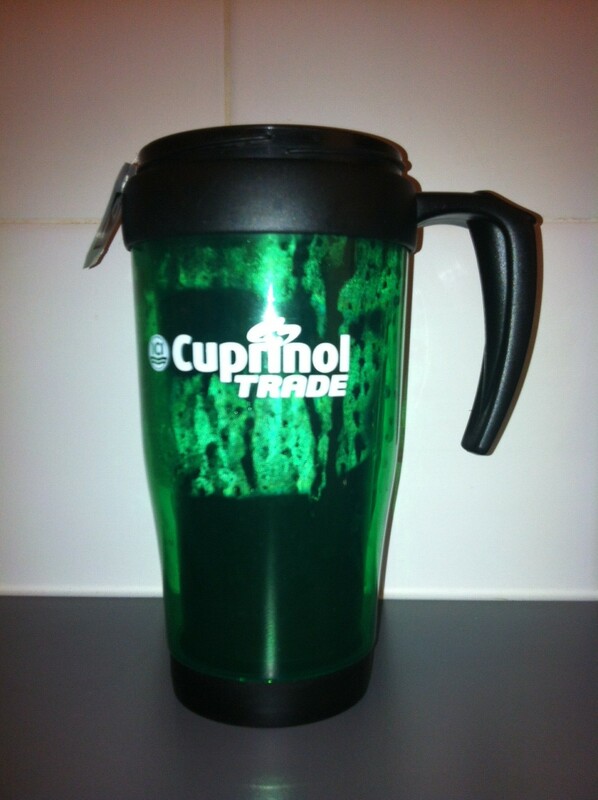 So, the Travel Mug makes it’s sophomore appearance, following Cuprinol Trade. Its deep, dark blue colour is emblazoned with a clean white logo. Simple and understated. Of course, we can can’t escape REED as their earthenware has previously permeated this blog before here & here. 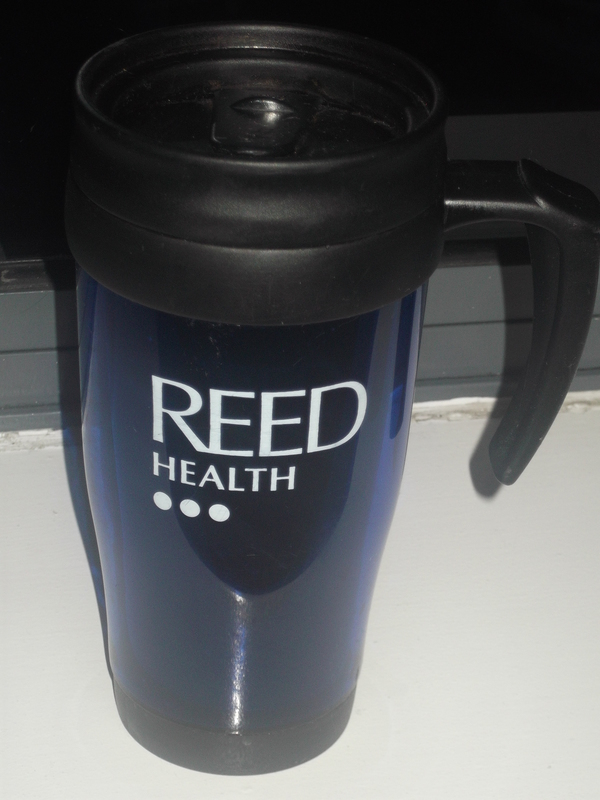 What will become of the REED HEALTH travel mug? Will it be ever be restored to a serviceable drinking vessel? Currently it’s sat on my desk and my COSHH training application has been submitted…. But if that fence were treated with Cuprinol, at least he wouldn’t get splinters in his you-know-where…. Mugspotters brings you more genre-busting action shot entirely live & on location in your typical works kitchenette/beverage bay. 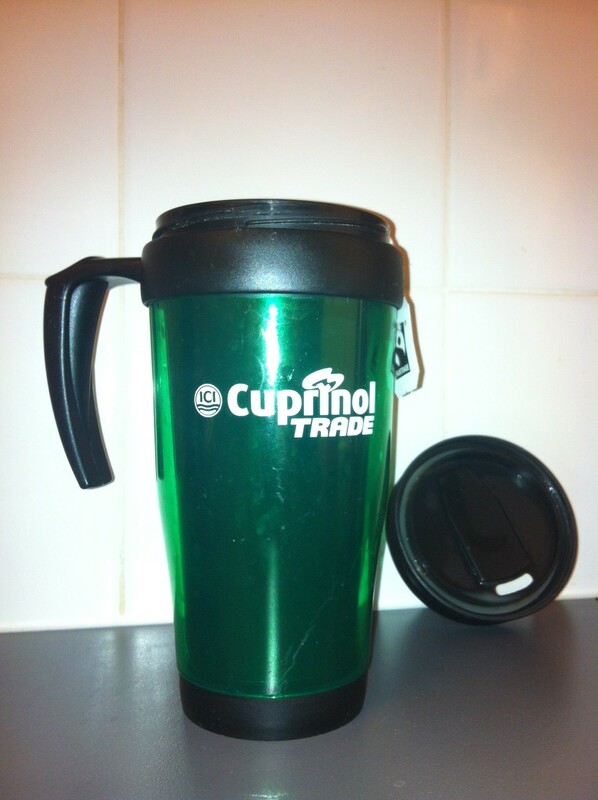 For your consideration, we give you – The Travel Mug. Abandoned, alone and looking quite tame, our intrepid photographer thankfully managed to shoot this before its owner returned and before we had to face any embarrassing questions.